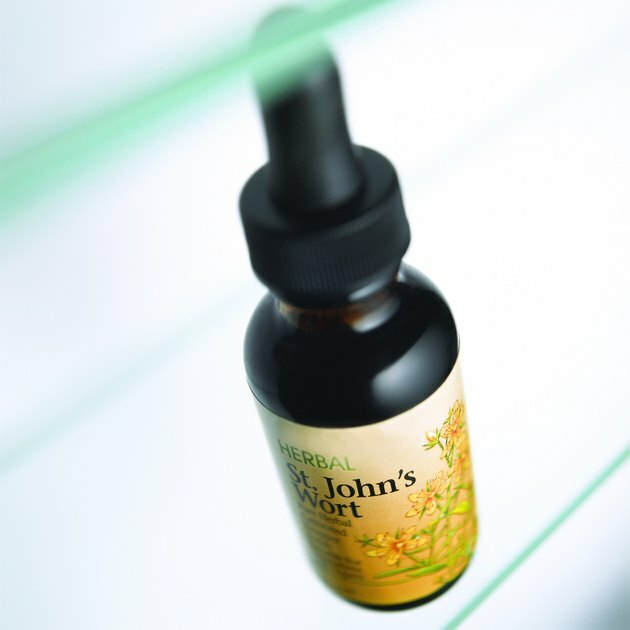 Hypericum perforatum, commonly known as St John's wort, has been used for centuries to treat nerve damage, sciatica and back pain. In more recent years, scientific research has supported use of Hypericum for other nervous system complaints, such as anxiety and depression. The flowers and leaves of Hypericum are full of natural phytochemicals, and can be used internally as well as topically to tone and restore the health of nerves. Hypericum is not intended to be a replacement for standard medical care, however, and you should check with your doctor before using it. The name Hypericum is Latin, originating from a Greek word meaning "over an apparition" -- highlighting its folk use to drive away malignant spirits and ghosts. In 1653, Dr. Nicholas Culpeper described the use of Hypericum in his book "The Complete Herbal" for treating wounds, bruises, inflammation, back pain and sciatica. Today, use of Hypericum as a nerve restorative herb in treating damage to the nerves and the nervous system continues with modern herbalists and pharmacists. Hypericum's actions on the nerves and the nervous system are attributed to the presence of compounds in the aerial flowers and leaves of the plant, including hyperforin, hypericin and psuedohypericin. If you're reading the labels of Hypericum products, you may find these chemicals labeled under the collective name of "total hypericin." According to Kerry Bones, author of "The Clinical Guide to Blending Liquid Herbs," the hypericin and hyperforin is largely anti-depressant and nerve restorative, while pseudohypericin affects viruses, bacteria, wound healing and immune function. While no research has yet been done on the effects of Hypericum as a topical treatment for nerve damage and nerve pain, one study used Hypericum internally for pain relief. In a clinical trial published in the journal "Pain" in 2001, researchers from the University of Southern Denmark investigated the effects of Hypericum on patients suffering from nerve pain and polyneuropathy. During the trial, patients taking Hypericum experienced a reduction in pain symptoms compared to a placebo, though researchers concluded the effect was not statistically significant. More, larger studies are still required to verify these results, and test the folk use of Hypericum as a topical treatment for nerve and back pain. According to Drug Information Online, Hypericum is well tolerated and has few side effects. Taken internally, Hypericum does stimulate the production of liver enzymes that affect the metabolism of many prescription medications. Because of this, Hypericum should not be taken alongside standard medication, except under a doctor's supervision. Some adverse side effects have been reported, such as increased sensitivity to sunlight, digestive upsets and mania, but these are rare. Consult with your doctor before purchasing Hypericum products.